PALM SPRINGS, Calif. ~ The auxiliary field played host to two high-scoring contests today, as the Toronto Rush defeated the Manitoba North Stars by a final score of 9-1 in the morning game. The Rush jumped out to a 2-0 lead in the second inning after Glenn Kubek nailed a triple to deep left field. Todd Weiss extended the lead in the fifth inning when his single brought home two runs to make it 5-0. Grady Caldwell rounded out the scoring for Toronto in the sixth inning with a two-run home run, and finished the game 2-for-3 with two runs scored and a double. Frank Podkul scored the only run for the North Stars on a sacrifice fly by Jordan Hurtt in the bottom of the sixth inning. Winning pitcher Larry Brown (2-0) threw five innings for the Rush, giving up four hits and striking out one. Marc Stewart took the loss for the North Stars as he surrendered six hits and gave up four earned runs in four innings but recorded three strikeouts. In the first game at Palm Springs Stadium, the British Columbia Bombers defeated the Oregon Lumberjacks 5-4. Oregon jumped on the board early, courtesy of a Kevin Riley two-run single in the first and an RBI double in the third. The Lumberjacks pushed across another run in the 4th on Charles Sturtivant II’s first hit of the season driving in Trevor Westmoreland who led off the inning with a double. The Bombers got on the board in the 6th inning with a solo blast from Alex De La Cruz-Rodriguez to left field. Oregon responded with another run in the sixth Jordan Hill’s first hit of the season. Down four in the top of the seventh, the Bombers rallied to score three off of a clutch three-run triple into right-center field by Parker Sniatynski. They would fall just short by grounding out with the tying run on third base giving Jonathon Howard the win. Howard (2-0) went six innings only giving up one run. Joe Romence falls to a record of 0-2 after going six innings and giving up five runs, four earned. Game two on the auxiliary field featured the Alberta Grizzly and the Canada A’s for the second straight day, but the result was reversed as the A’s got revenge and defeated the Grizzly 9-1. The A’s struck quickly, getting on the board in the top of the first inning when leadoff hitter Tyler Pfeffer reached on an error then came around to score on Joshua Henderson’s double. The Grizzly retaliated with one run in the bottom of the second inning when Chip Northrup led off with a double and came into score on a bases-loaded walk to tie the game at one run apiece. However, when the Canada A’s brought their ace reliever Kevin Grendell in to pitch the third through fifth innings, that spelled doom for the Grizzly bats. Grendell faced ten hitters and struck out seven of them, effectively shutting down Alberta the rest of the game. The A’s added four runs in the third inning, highlighted by a double off the bat of Joe Becht and another hit from Henderson. The A’s scored three more runs in the fourth inning via three singles and a double. In a well-rounded team effort, every A’s hitter reached base at least once, while Pfeffer, Becht, and Henderson each recorded two hits. 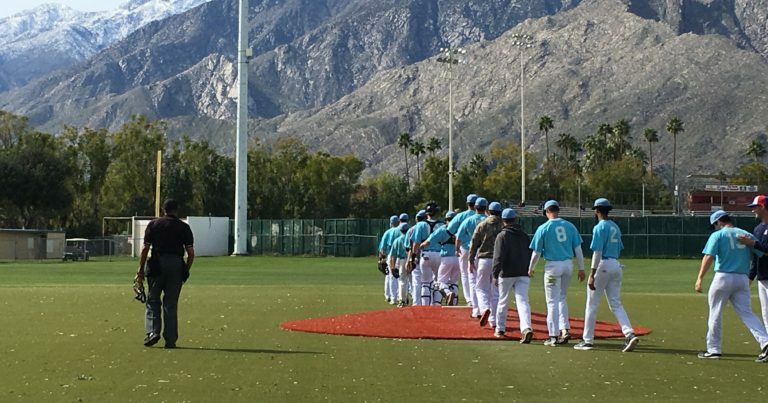 The second game at the stadium featured both Palm Springs based teams as the Chill battled the Power and took home the 2-1 win. Brandon Nylin pitched six innings for the Power, and faced the minimum through the first four, an error by the second baseman in the fifth would end his streak. The Power only pushed one run across when Kevin Connolly bunted for a single to lead off the inning before stealing second and advancing to third on a wild pitch. Jordan Patterson drove him in with a sacrifice to right field to give the Power the lead 1-0. This score would hold until the top of the sixth when the Chill strung a few hits together ahead of Corey Dempster, who drove them in with a single to give them the lead. The bottom of the seventh gave hope for the power as they got Michael Moffat to third with two outs but were unable to bring him in. Anthony Baleto came away with the win after pitching two innings and not giving up a run. Nylin gets the loss after giving up two runs, one earned, in the sixth. Wednesday at the California Winter League will be $1 admission courtesy of Jack In The Box. Game one at the stadium features the Palm Springs Chill @ the Alberta Grizzly at 10 AM, followed by the Canada A’s @ the British Columbia Bombers at 12:30 PM.